It’s already one month since Mobile World Congress 2019 landed in Barcelona for another edition of the annual tech gathering. This year’s theme of ‘Intelligent Connectivity’ was evident in phones, wearables, cars and even a spaceship – all driven by 5G. Foldable handsets from Huawei and Samsung delivered a big screen that still fits in your pocket. Audi and BMW showed off the latest electric vehicles – the latter also offering control by voice, gesture and gaze. And Microsoft launched its latest mixed reality headset, Hololens 2, an exciting upgrade, albeit with a $3,500 price tag that keeps it out of range for most people. But what of exhibition stand design? In a sea of high gloss white architecture, giant screens and branded light boxes, creating stand-out without spending the entire marketing budget is a regular challenge. 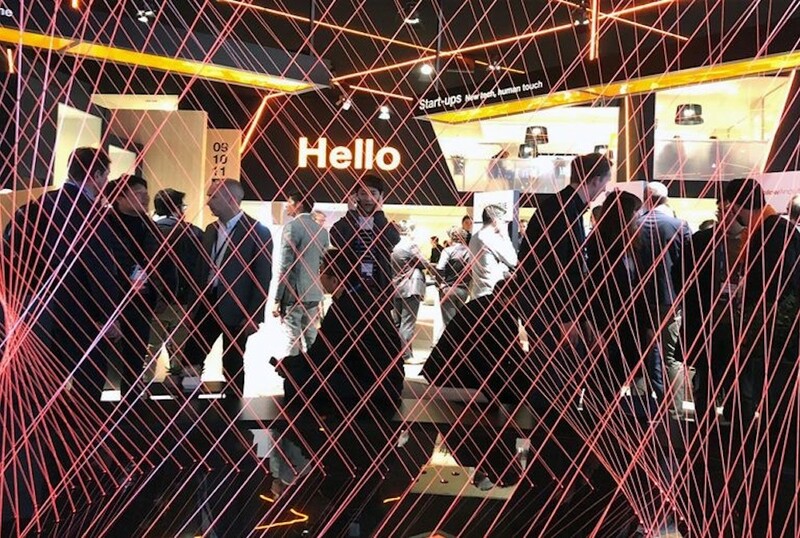 One of our favourite spaces at the show, Orange used LED tube lights and a wire art sculpture to reflect faster and more powerful 5G networks. This clever and relatively simple ‘real-life’ installation was an antidote to the bright artificial light used throughout the show. Our own clients created cut through too. Atos Worldline, a leader in the FinTech space, showed off their mobile payment solutions from their hospitality pavilion featuring clever use of graphic walls. Sigma used their compact double deck space to entertain service providers in an informal lounge and private meeting spaces while discussing digital transformation. The good news for exhibitors is that well-considered creative ideas that standout can be both cost-effective and highly impactful. At DSA, we’ve been combining this kind of creative thinking with high quality production and reliable client service since 1995. If you’re planning a new stand at MWC 2020 or at a trade show elsewhere else in the world, get in touch today. We’d love to talk to you.